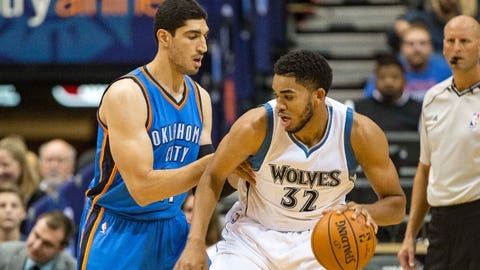 Timberwolves rookie Karl-Anthony Towns attempts to dribble around Oklahoma City center Enes Kanter (left) in the first half at Target Center on Wednesday night. MINNEAPOLIS — Kevin Durant scored 15 points in 22 minutes in his first NBA game in eight months and the Oklahoma City Thunder beat the Minnesota Timberwolves 122-99 in the preseason opener for both teams on Wednesday night. For the Thunder, Durant had not played since Feb. 19 because of a broken right foot. He made 5 of 8 shots and had four assists. Russell Westbrook had 14 points, 13 assists and eight rebounds in 22 minutes. Additionally for Oklahoma City, Serge Ibaka had 18 points and six boards in coach Billy Donovan’s NBA debut. For the host Timberwolves, Karl-Anthony Towns, the No. 1 overall pick, had 18 points on 8-for-12 shooting in his NBA debut. Gorgui Dieng scored 18 points on 6-for-8 shooting. STAR WATCH: Durant showed no ill effects after needing three surgeries to repair his right foot. … Towns made his first four shots in a sharp debut. UP NEXT: The Timberwolves travel to Winnipeg for a game against Chicago on Saturday. … The Thunder host Turkish team Fenerbahce on Friday.